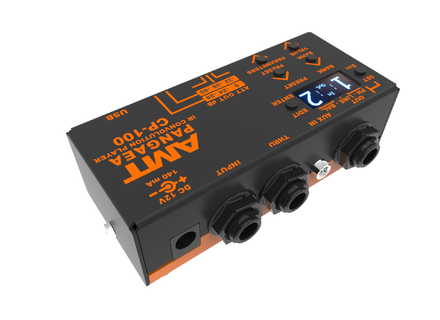 Pangea CP-100, Guitar Cabinet Simulator from Amt Electronics. I own a racked Two Notes Torpedo VM202. As I couldn’t find a used Torpedo C.A.B. for a bargain price (which shouldn’t come as a surprise considering the product’s high quality), I opted for this AMT which is an IR player allowing to access parameters. I got the model with the orange inscriptions on while the shop’s website advertised it in white – but that’s juste a detail. The idea was to make a transportable pedalboard. You’ll have to read the manual is you want to understand which IR CAB + MIC you’re loading. I also let my brother use it. He often works as a FOH engineer and I wanted to see it the Pangea could do the job to replace a mic+cab setting in stage: well, clearly the result is exceptional! 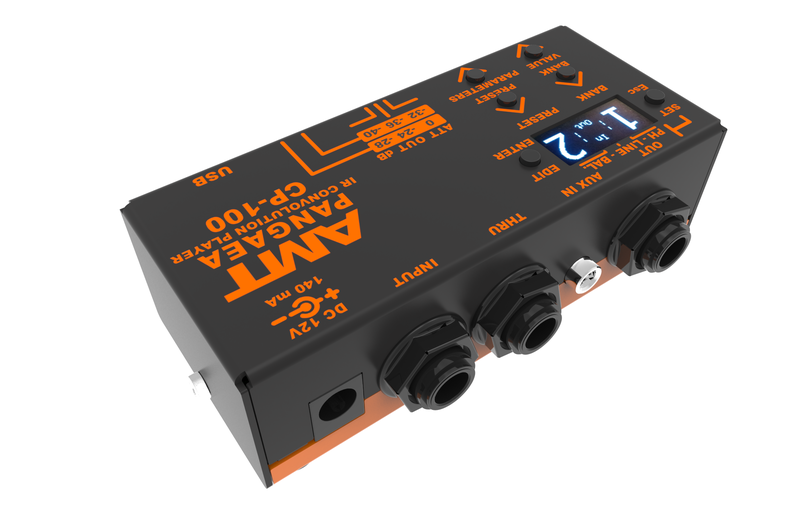 Depending on the amp used, it has either been plugged in the FX loop allowing to feed the mixer with a signal level independent from that of the tube poweramp part of the amp, or at the output of a loadbox. I heard it can even be plugged between the amp’s output and the speaker using the THRU jack plug, but I have no use of such a setup and haven’t tried it in order to protect the amp. It’s so small that it can be used indifferently in a home or professional studio, I have already lent it tu be used for remiking tracks. It also works wonder with bass IRs, while testing it the bass player ended up saying that with a total 3 pedals (including the Pangea) he couldn’t say whether his sound was that from his amp or from an IR straight out of this tiny black box. In the end, he bought one! This small device will easily find its place on your favourite pedalboard, between preamps and dists and before modulations, delays and reverbs. I think it’s a perfect complement for anyone using many vintage analog pedals but also those not using tubes at all. I frankly recommend this product, I first hesitated with LOGIDY EPSI but this AMT-PANGEA suite me better as to the way to access the various parameters. Small enough to make it the pedalboard equivalent of what a USB key is to a computer, I still regret the lack of an editor and the absence of a power tube stage simulation (like on products by Two Notes and Fractal), which addition would have made the Pangea perfect.